2003 was my last visit to Fairbanks and so about time I checked what changes the 'propliner scene' could be noted here. Several hulks of Everts Air have found a destination off airport and I made an attempt to find some. One was easy as it was close to the airport, the other one had been moved again and I found only remains while the last one was too far out when I decided to cut my visit from 3 days to 2 days. Below is my report; some aircraft need further identification. Truly a fantastic restoration: Travel Air SA-6000-A NC9966 (c/n 1099). Most of the work was done by, or supervised by, Ron Klemm who is a retired Everts Air pilot and Chief of Operations. What started out as a project to replace the fabric and some wing repairs, became a full blown rebuild. NC9966 was put on floats in 1940 or so and they lasted until recent years; for now she’s been put on wheels, but maybe one day we’ll see her again on floats. Rob Everts is the owner of this beautiful Classic. He flew the Travel Air to Alaska Airmen's Trade Show at Anchorage IAP earlier this year. What a wonderful transport to fly and tour your guests in! "The 'Time Machine', Travel Air SA-6000-A N9966 has flown for the first time in roughly 5 years after a 2 year rebuild. Ron Klemm was primarily responsible for the work and he did an outstanding job. She's now down in Anchorage for the Trade Show this week end. It took her some 2 hours and 35 minutes to fly from Fairbanks to Anchorage, and arrived there with very little wrong with her after her first long flight after all this work. This spring work will start on her floats, and maybe in time for duck hunting she'll be ready to make her traditional trips over the ridge to Minto Flats and the Duck Camp." That webpage also has some glorious air-to-air photos, go look and see! Those wicker chairs were made to order; it certainly is a craft to perform a restoration such as this and full marks for the job on this 1929 Travel Air! I am grateful to the people who take the trouble (and the expenses!) to do such work. Also present in the Everts’ north end hangar: Curtiss C-46F Commando N1651M (mfr 1945; 2508 is often quoted -and reg'd as such by FAA in 1948- !as manufacturer's number but is in fact a Curtiss linenumber, c/n is 22399 - thanks to Aad van de Voet for pointing this out! ), reg’d 10Nov1998 for Everts Air Fuel and stored for a number of years now. Curtiss C-46F Commando N1837M (c/n 22388) is often based at Kenai for its fuel hauling operations; as such I’d seen “Hot Stuff” rev up its engines in 2006, look HERE.. I wouldn’t be surprised to see them on their way out. I love Everts’ tradition of adding nose art! ‘Maid in Japan’ is Curtiss C-46D Commando N54514 (c/n 33285, mfr 1944). It was reg’d 09Dec1996 to Tatonduk Outfitters Ltd (the parent company of Everts Air Cargo and Everts Air Fuel). Behind C-46D N54514 in this hangar is Douglas C-118B N451CE (c/n 43712); manufactured in 1953, it was registered to Everts Air Fuel as recent as 10Dec08. In terms of livery they have quite outdone themselves! to carry fuel to some of Alaska's smallest runways - so an addition, not a replacement. Yet. N6586C is Douglas DC-6BF (c/n 45222) and reg’d to Everts Air Fuel on 11Jul2011. It is standby on the ramp, awaiting its next fuel hauling mission. Now is that a beautiful line up or what? N100CE is Douglas C-118A c/n 44662, manufactured in 1953 (according to FAA Registry website). It was registered to Tatonduk Outfitters 05Mar2010. Towards the very end of the Navy Reserve operation of originally Air Force operated C-118's, they didn't redesignate them as B's or give a Navy Buno." John Benton wrote me July 2012: "N100CE is former USAF s/n 53-3291 - last operated by VR-52 Willow Grove." N747CE is Douglas C-118A c/n 44661, manufactured in 1955 and while appearing in splendid shape here, it lacked one or two engines on the lh-side. I also found on FAA Registry that its certificate had been terminated, so its fate may be in the balance. The main cabin still had the fueltanks in place, see below. But in July 2012 the 'Everts Air Fuel' titles were changed to those of 'Everts Air Cargo' and the tanks were taken out: back to common cargo hauling! John Benton wrote me July 2012: "N747CE is former USN 152689 - VR-54 det. Atlanta/VR-46 was the last military operator." N251CE is Douglas C-118A c/n 44612, mfr 1953. The condition seems to worsen while walking along this line up of these Sixes, as more engines had been taken off from this DC-6. I remember seeing N251CE in 1995, still with 'Air Cargo Express'-titles on it, Rob Evert's company at the time. I noticed that on FAA Registry website, its registration for Everts Air Fuel dates from 26Apr2012, so all is not lost. John Benton wrote: "N251CE is former USN 153593." N555SQ is an odd one in terms of tailnumbers; this DC-6B’s registry dates all the way back to 13Apr96 and doesn't appear to be quite airworthy here. Seen under the nose of N251CE are two DC-9s: the jet age has come for Everts Air Cargo as well! These ones are in the donor yard, the operational ones seem to be based in Anchorage. Douglas DC-6B N444CE (c/n 45478) is also part of the Everts Air Fuel fleet, it was reg’d 18May01 and the ‘Spirit of America’ is quite a splendid nose art! Ron Klemm seems to be responsible for this work of art. But the paintwork is fading, showing it has seen quite a bit of work. Embraer Emb-120RT Brasilia N269CA (263 on the nosewheeldoor: c/n 120.263) sits in the ‘donor yard’ for spares support. remained restricted to being a donor of parts. Elsewhere was another Confifair DC-6A, N3050P (below). '(44-)78628 - Lend-Lease to China. To XT- registry with China National Aviation Corp., to N8369C, then to XT-130, to B-130 Mar 1959 for Civil Air Transport. To HP-316 20Oct1960, 'Sold' to Southern Air Transport (CIA operations -Webmaster,RL) 14Sep1961, flown as '857' in Bay of Pigs operation Sep 1961. Registered as N74811 11Oct1961. Lease purchased by Rosenbaum Aviation 24Nov1973. Lease purchased by International Airlines Academy, 02Sep75. Transferred to Trans Continental Airlines (Willow Run) Feb 1978. Sold to F A Conner 11Aug1978. Sold to Cryderman Air Services Inc, operated as Century Airlines 11Aug78. To N777AF in Nov. 1985. To N18AC in Oct. 1995 and to N23AC 15Oct1997. On my previous visit, in 2003, I’d seen several C-46s sitting in this yard but on this visit 2012 only Curtiss C-46F N23AC (c/n 22451) remained. N23AC was bought as recent as Sep. 2002. Plenty of spare parts surround the Curtiss Commando. Next time I’ll ask for a souvenir! I suppose that the other C-46s have moved to the yard across the road, to make place for the 'Sixes' of NAC. Robert Everts managed to acquire 300 sets of C-46 wingtips from 20 vanloads of military surplus, purchased some years ago. Flying the C-46 into the many rough, unimproved airstrips around Alaska has its risks... One of which is striking a wingtip against a tree or snowbank beside the runway. But at Everts they can also manufacture new parts as required, as the company has all the C-46 drawings. Full history & photo of N23AC msn 22451 detailed on FAIRBANKS 2003. And who would have thought this C-46 was still destined to go places...? 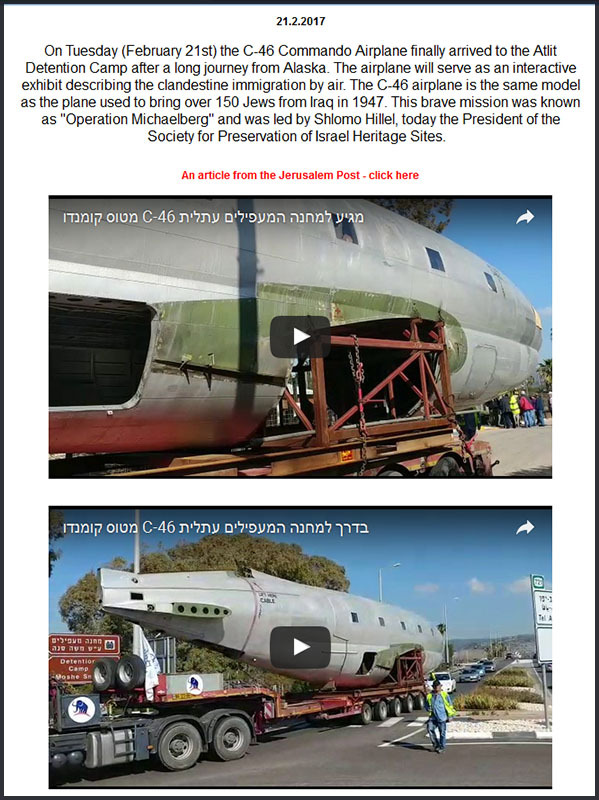 I read a nov.2016 post on WIX (Warbirds) forum and found confirmation of actual arrival in Israel (& purpose) "I have some news on the C46 that the Atlit Detention Camp Museum acquired. The plane is actually coming out of Alaska, not Argentina as previously reported. It is currently (Nov.2016) disassembled, crated and is in transit through the port of Seattle with expectation to arrive in Israel in about 2 months time. This particular aircraft N23AC has a very colorful past, having been owned by the CIA operatives and likely involved in many clandestine operations into Central and South America." Everts Air confirmed to me yesterday (07Mar17) that it is N23AC (c/n 22451): "Yes it is; we also have 2 mechanics that are there working to reassemble the aircraft. Expect them to be there a few months. We were very excited to be part of this museum project and it has been since early last spring getting this planned." Photo taken by Mike Osborne, he is an employee of Everts Air Cargo since the early 80s and is a most experienced C-46 mechanic! 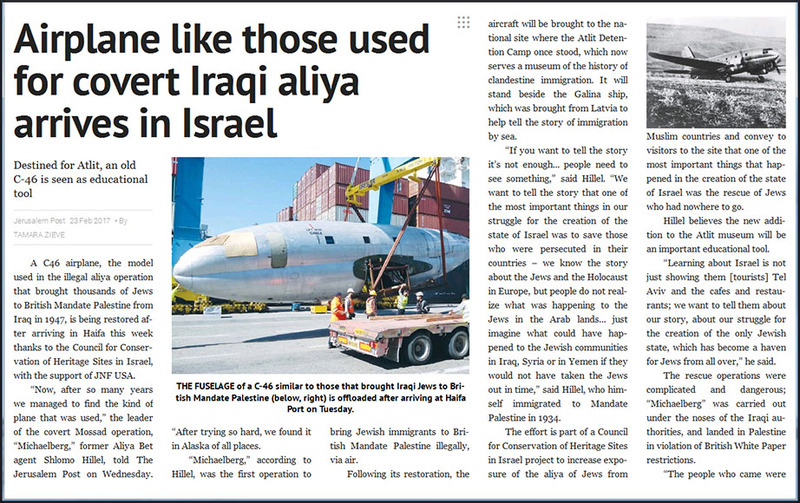 I think the article refers to "..Like most Arab League states, Iraq initially forbade the emigration of its Jews after the 1948 war on the grounds that allowing them to go to Israel would strengthen that state. However, by 1949 the Iraqi Zionist underground was smuggling Jews out of the country to Iran at about a rate of 1,000 a month, from where they were flown to Israel." "Al Schwimmer, who had been a flight engineer in TWA, was recruited by Yehuda Arazi (a most skilful and highly successful operative). Schwimmer immediately recognized the importance of large aircraft for transporting military material to Israel. "C-46 Commandos also went back to war. A dozen surplus C-46's were purchased in the US covertly for use in Israel's 1948 war for independence and flown to Czechoslovakia in a circuitous route along South America and then across to Africa. The type's long range proved invaluable flying cargo, including desperately needed dismantled S-199 fighters from Czechoslovakia as well as other weapons and military supplies. 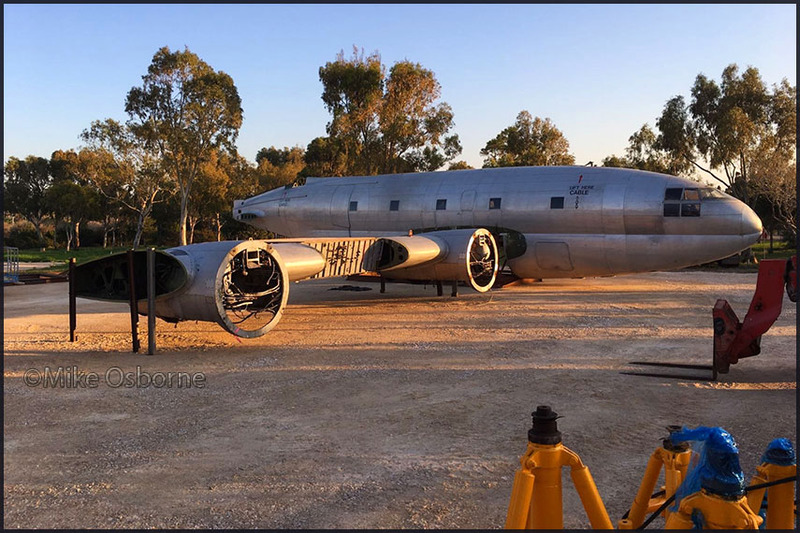 A C-46 airplane, the model used in the illegal aliya operation that brought thousands of Jews to British Mandate Palestine from Iraq in 1947, is being restored after arriving in Haifa this week - thanks to the Society for Preservation of Israel Heritage Sites, with the support of JNF USA. "Now, after so many years we managed to find the kind of plane that was used," the leader of the covert Mossad operation, "Michaelberg," former Aliya Bet agent Shlomo Hillel, told The Jerusalem Post on Wednesday. "After trying so hard, we found it in Alaska of all places!" and Bolivia but the aircraft eventually acquired came from Everts in Fairbanks Alaska. "Ruud, very interesting about the Atlit Detention Camp Museum obtaining a C-46 for display! I wrote about the C-46s converted for commercial aviation following the war (including the B-17s illegally flown to Israel) in my book, Hang on and Fly, subtitled 'A Post-War Story of Plane Crash Tragedies, Heroism, and Survival'. Your readers may enjoy it. " C-118A N4206L (c/n 43709) is a former Northern Air Cargo. Other than DC-6A N6174C, none of the NAC DC-6/C-118 aircraft sold to Everts will fly again; they were all time-expired Part 121 aircraft and the deal stipulated that they would not be flown as Part 125 aircraft. The ‘330’ on the nosewheeldoor mark it as N99330, ex/ NAC C-118A (c/n 43576). Delivered to USAF as C-118A 51-3829, it later became C-GPEG (1986 Bob Garrard photo on Airliners.net). Sold to Northern Air Cargo as N99330 and bought 25Sep09 by Everts Air Cargo . Another shot of N99330, from the road. Douglas C-118A N1036F (c/n 43581) was delivered, as 51-3834, to the USAF on 09Dec52 and its service life lasted until Dec74, when it was parked among other old tired iron in the desert of Arizona. Robert G Sholton bought it on 12May76 and had it registered as N1036F on 19Apr79. It was transferred to Northern Air Cargo (NAC) in Jun81. Robert 'Bobby' Sholton and Maurice Carlson founded NAC in 1956. NAC was originally a charter air freight service with two C-82 'Flying Boxcars.' Early work included delivery of generators and vehicles to remote DEW Line sites, miners and settlements; delivery of freight to rural communities on a charter basis; and assistance with special and emergency situations, including the Good Friday Earthquake in 1964. Sholton died in 1982 . After that, NAC’s board was overseen by Rita Sholton, Sholton’s widow. During Feb06 Northern Air Cargo was taken over by Saltchuk Resources, which decided to terminate DC-6 operations altogether, effective 30Sep08. N1036F was bought by Everts Air Cargo 25Sep09, for use of its spareparts. c/n 43554 once flew for KLM Royal Dutch Airlines, as PH-DFM! Reeve Aleutian (from Jun65 - jun78). By 2003 it had only some 500hrs left before main & costly airframe overhaul. The numbers on the nose, '604' and '8C012' identifies this one as N810CS, C-118B c/n 43707. This is former US Navy BuNo.131604 coded RZ. Flown early 1999 to Fairbanks for use of its parts. Everts Air Cargo 01Sep02. During 2009 it was found N888DG needed a major airframe overhaul, with obvious result. John Benton added: "N888DG is former USAF 53-3304." DC-6A N400UA (c/n 44258). This is ex/ Piedmont Air Transport N400UA, bought in Jan95. At Palmer,AK 26jun98, been reg'd to Tarheel Aircraft Leasing Inc 09Jan98. Later that year it was reported at Willow Run airport, near Dettroit, operating for Karon Gilespie Air Transport, hauling carparts. Tarheel sold N400UA to Woods Air Fuel at Palmer,AK. Date 18Jun98. It was still carrying the name 'Miss Karon'. Woods Air went belly up and N400UA was bought by Tatonduk Outfitters (Everts Air), reg'd 30May03. It was sent south to Payne Field for some sheetmetal work. On 02Aug04 it was registered to C&R Leasing LLC, connected to Everts Air. Not sure if it joined operations then, I received a report dating 13Apr07 at Fairbanks doing engine run ups. Martin 'JoeJoe' Prince Jr sent me photos of N400UA visiting Bethel,AK. Now it has been put aside for supply of spare parts. The rear has vanished, probably the least interesting part to safe for parts. By deduction this was either DC-6A/C N779TA (c/n 45529) or N2907F (c/n 44636); both were photographed. painted grey) as well as the (faded) titles on one, it was concluded that the above is... N2907F ! See a 2010 photo, of N2907F in better days, on Planepictures.net. This Douglas C-118B (c/n 43696) was delivered to the US Navy as 131593 on 24Mar53; in those days it was designated R6D-1, later to be designated C-118B. The USAF took use of it, 1958 - 1964. It was retired from service in Apr82 and found a parking spot in Davis Monthan's 'Military Aircraft Disposition Center (MASDC), later renamed AMARC. N951CE was assigned to for CE Aviation Resources in May90, which sold it to Everts that same year, in December. CE Aviation Resources is the same as Everts Air / Tatonduk Outfitters (CE=Cliff Everts?). But it remained in Arizona for a long time, good place to keep it if you have no immediate need for it. In 2002 work was started on it and it departed Tucson on 12Apr03 for Fairbanks. In 2003 I found it parked on the ramp near Everts' old (north end) hangar; it didn't travel far: into the 'donor yard'! N9148F (left) is a Douglas C-118A (military variant of the DC-6), with construction number 44669 and linenumber 636. It served the USAF from its delivery on 26Nov55 until it was stored in the desert of Davis Monthan AFB, in Arizona in Feb75. It's militairy serial was 53-3298. Everts Air Fuel bought it in Nov95 and leased it to Air Cargo Express (Everts Air Cargo as from 01Sep02) from Jul00 until Dec00. But it probably has been inactive and stored all the time as it still carries 'United States Air Force'-titles and military roundels, I don't see it having delivered cargo around Alaska like this! N9148F; and no I didn't go in/up there..
Two former Conifair ( went bankrupt in Nov.2001) birds can be found here: Douglas C-118A N3047V (c/n 44658, photo above) and seen here DC-6A N3050P (c/n 44073). They were former C-GBYS and C-GBYB resp. for Conifair. 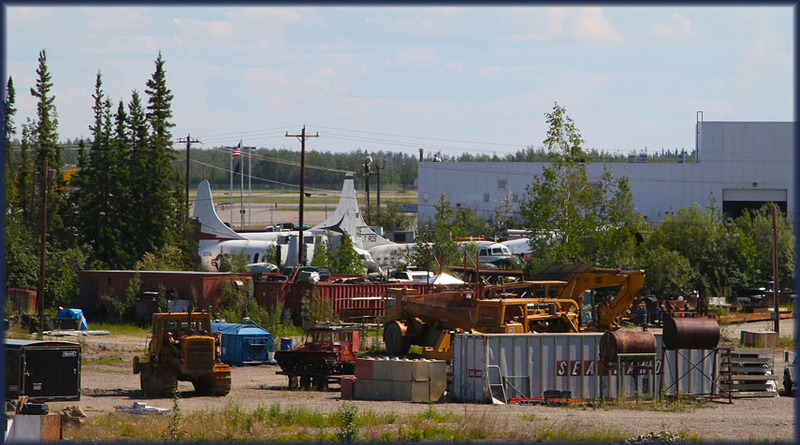 In my FAIRBANKS 2003 report I had one listed as 'unidentified, metallic, no markings, in storage yard'. It is the former N60759, its identity was confirmed to me by Everts Air and due to its low flying hours it will be put into the air again!" Dietmar 'Yakfreak' Schreiber, from Vienna. C-119G N8504Z (c/n 11253) of Everts Air Fuel, Fairbanks,AK. Reported in flying condition in 1994, it seems it really did not do much flying. Further reports always refered to it as "stored". As it was in 1995. The aircraft has been for sale, perhaps an aviation museum will turn up - but flying it out will be a challenge. Across the road from Everts Air offices is another storage yard. These two photos show Convair C-131s and Curtiss C-46 Commando's being stored here. Among a collection of cars, including a fire engine! Convairs N2409R (C-131F, c/n 303), N9767Y (C-131F, c/n 288)are probably among these, as seen HERE 2003..
And C-131B N2034L perhaps too, as it was at Fairbanks in 2003 on the ramp as a recent arrival. and the one on the right with the white tail is N2034L. All three 100% sure & confirmed!" Two Curtiss C-46 Commando's hiding in the bushes, as Commando's do! Perhaps C-46A N4860V (c/n 30240) is still there too, its reported to have lost its tailsection to Buffalo's C-FAVO. Neil Aird also got a better view, in his 1995 visit. In 2003 Northern Air Cargo was alive and well, with still plenty DC-6s doing their trade. But a new owner, Satchuk Resources, changed policies and jets replaced the propliners. Most DC-6s were bought by Everts Air Cargo, some still linger here; actually the only one in complete form is N434TA, a DC-6BF/ST - ST short for 'Swing Tail'. in 2001 it was deemed at its end of its airframe life, needed a major overhaul and found it wasn't worth the expenses. Since then it has been for sale, its unique capability possibly making the asking price higher than regular DC-6s and unattractive for Everts to buy it for parts; but that's just my theory! UPDATE: on 26Jun2013 it was ferried to Yellowknife, Canada for the new owner: Buffalo Airways! UPDATE (FEB.2017): N434TA after its arrival in Hay River in 2013, N434TA was subsequently stored at Hay River for Buffalo Airways; see this Flickr link to a 28May 2016 photo. And see Propliners by Dirk Septer for a 2017 UPDATE. painted grey) as well as the (faded) titles on one, it was concluded that the above is... N779TA! abrupt Roger Brooks ceased operations. Once operated by Aero Union (Chico,CA) as N76AU in USAAF livery & coded 272442, I photographed it in May96. Delivered by Douglas as a C-54D to USAAF in Jan45 and redeliverd to US Navy (BuNo.91994) in 1946, it was converted to C-54Q variant in 1962; stored at MASDC Sep70, sold to Aero Union & reg'd N62296 but changed to N76AU Jan76, named 'Spirit of America'. Bought by Aero Flight (Kingman,AZ) in 1999 and reregistered N3054V, put to use (?) as airtanker fighting forest fires. Reg'd 28Jun07 Brooks Fuel Inc. It seemed that Roger Brooks had it in use as a freighter (or fuel hauler? ), for in dec.2014 I received "...Chris Houchin is president of Alaska Air Fuel and he emailed me with the news that former Brooks Air Fuel DC-4 N3054V is now on line with the company after being converted to a tanker. Brooks had used the aircraft as a freighter and the FAA recently approved the tanker conversion!" Update courtesy of Ralph Pettersen. Someone made the following report of a visit 12Jun16: "... a bit of luck at the old Brooks fuel ramp, as a guy who has a hanger near by escorted me out to shoot the ex Brooks fleet of Douglas classics, sadly now though looking a bit sorry for themselves. Brooks Fuel Boneyard: N95460 Douglas C-47 Dakota faded Air North tiles, N90251 DC7C, N438NA,N51802,N90201,N67018,N99212 C-54's, N114V Beech C-45, and a couple of PA31 Navajos, N9680T,N21406". Various parts and tools still linger in the yard of Brooks Fuel. Douglas C-54E N96358 is awaiting a new owner. N96358 is Douglas C-54E (DC-4, c/n 27284), registered for Brooks Fuel as recent as 25Jan2007. on firefighting contract at Palmer,AK so no stranger of these parts. Hopefully it will find a new owner. always were met here with a kind word and shared enthusiasm for propliners. The gate was padlocked. Photos of planes at Brooks Fuel canbe found at my reports of Alaska 1995 and 2003 Bliss with Brooks! "Alaska Air Fuel has been very busy flying heating oil to the Nixon Forks mine from its base in Palmer, AK. is currently have tanks installed in Fairbanks by Roger Brooks and will join N96358 in the next few months. Alaska Air Fuel also purchased the remains of DC-4 N82FA and other spareparts from Roger Brooks." This DC-6 has been placed between the thresholds of rw02L and rw02R, for fire training purposes I think. It has been reported to be DC-6B N4390X (c/n 45066), its history can be found on my Fairbanks 2003 report. "When we got it back from France, based on the records, it was the better of the two, but when I went to inspect it: Corrosion Queen! The French government must have been subsidizing an aluminum production plant somewhere! So there she sits for the airport fire department to play with..."
I went looking for some DC-6 planes that were donated by Everts Air to parties outside the airport. This was what I found of DC-6 N666SQ (c/n 43004), donated to Vietnam Veterans Motorcycle Club. it so I guess that keep it well out of sight to prevent people visiting. N999SQ 'The Lucky Duck', quite an eyecatcher! One plied the airways as a proud Douglas DC-6B (c/n 43274), flew for Macavia and T&G Avoation before joinging Everts Air Fuel in 1994. I photographed it in 1995 (see also for its complete history) and it was used for spares the. Preserved such as this, at Pike's Aviator Greenhouse (near the airport) is as good as it gets. We had a quick look at the Seaplane Base and the airstrip for single prop planes, but found nothing remarkable. I am indebted to Karen Wing and Rink for their time and hospitality, many thanks!